The arrival of Stephen Strasburg to Washington is hard to top in DC Sports life over the last few years. Only the arrival of Alex Ovechkin to the Capitals in 2005 is in the same league over the last decade. Much was made of the young fireballer’s arrival in 2010 as a harbinger of a successful Nationals team, and there was much on the 22-year-old’s shoulder as he started the season in AA. Before he’d left AAA, a signed rookie baseball card had reached $100,000 on Ebay, and Dave Sheinin’s feature tetrology on Strasburg had been all over the Sports section of the Washington Post. On June 9th, Strasburg got the ball for the first time at Nationals Park, where he came just shy of the strikeout record for rookies in their first start. We recapped the game, it was a remarkable demonstration of what Nationals Park could sound like 81 nights a year if the team could put together a winning record. 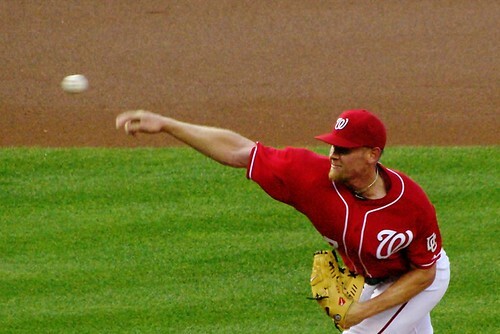 Strasburg would struggle behind the Nationals’ anemic offense, delivering good performances, but failing to get wins. His record in late July was 5-2, with a 2.33 ERA, and had struck out more than 70. Strasburg would suffer from some tightness after his start on July 21st, and would spend three weeks on the DL as a protective measure. He would pitch just three more outings before tearing a tendon in his elbow. The departure of Strasburg would also mean the departure of MASN color commentator Rob Dibble, who was let go after he made some comments regarding Strasburg’s injury that were ill-advised. The Washington Capitals. There was a time, in the not-to-distant past, actually, where this team was about as scoffed at as the current Redskins era. A gritty team but one of mediocre talent that many old-timers wondered if they’d ever cross the hump into the greatness that the Detroit Red Wings, Montreal Canadiens, and Edmonton Oilers of old acheived. Last year sparked that hope. The 2009-10 season will still be best known for the epic choke in the first round of the playoffs. Dropping a seven game series to the suddenly-hot Montreal Canadiens was one of the best examples of “epic fail” in this city as many can remember. The Caps at the time looked to be THE TEAM to win the Stanley Cup with one skate tied behind their back. Then they hit the Wall of Halak and their fall from public grace, if only for a short time. But round one fail aside, the Caps last year were a team to be reckoned with. Handily winning the league’s President Cup (and, some say, the resultant curse) with 121 points, including a league record string of 14 wins in a row, the Caps’ season was one of excitement and energy both on and off the ice. Changes were made, trades conducted, young rookies brought up – all of it only adding to the strong core that owner Ted Leonsis and general manager George McPhee had painstakingly put in place. It is a core that still beats today as the team continues its quest for the NHL’s ultimate prize. Last season was the season of hype, a season of building excitement. The Capitals, with their sheer talent and highlight-reel play, managed to ignite this city’s interest in hockey and help turn its attention from the dismalness of the Nationals, Redskins, and Wizards and bring the optimism of another possible championship to the DC area. Many area sports cynics will look back at the Caps’ ejection by the Canadiens as proof of DC’s perennial habit of our teams’ constant failing in the heat of a championship. But when the Caps finally win the Cup in the near future, more will see this past year for what it was – the beginning of a new sports dynasty in our midst. The 2009-10 season didn’t end great for the Wizards. Even casual observers of the team may pick up on the fact that between your biggest star getting suspended for pranks involving guns and then mailing in the season by dumping other contracts, it wasn’t going to be easy. It wasn’t a great season, but since there were some teams that managed to be worse, the Wizards went into June’s lottery with this sneaking suspicion that it would take a small miracle to walk away with anything other than a good, but not top, first round pick. As the envelopes were being shown, it appeared that Abe Pollin was smiling down. Even though the Wiz had just the sixth highest chance to earn the top pick, fate would have the ping pong balls bounce their way, and the first overall pick in the 2010 NBA Draft was theirs. The prize to be secured with that selection? An absolute stud of a freshmen guard from the University of Kentucky, John Wall. For a team that has had to fight for identity over the last decade – sometimes in the face of some imagined nostalgia for the moniker that used to represent it - this was great news. A new visage for the franchise, and another worthy addition to join Ovechkin, Strasburg and Bryce Harper as first round draft picks who would anchor a team. 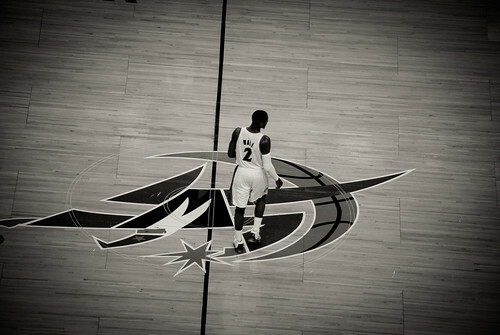 The current season that started in October – the first under new owner Ted Leonsis – has begun very much as a transitional year, evidenced by the trade of former franchise player Gilbert Arenas at the beginning of December. There’s no question: this is now the John Wall era at the Verizon Center. Will it be plentiful? And will Leonsis finally change the colors back to red, white and blue? We know the answer to at least one of those questions, hopefully Wall can fulfill his part to make 2011 truly special. This is a painful story for Redskins fans everywhere, as Haynesworth was supposed to spell a new era of defensive dominance for the burgundy and gold. The story actually begins right at the beginning 2010, when the Skins signed Mike Shanahan as head coach. Shanahan brought in Jim Haslett to run the 3-4 defense, and that meant that Haynesworth would have to switch positions to fit into the new scheme. First Haynesworth skipped out on mini-camp conditioning, then he demanded a trade in June. Remember, this is the guy who said at the end of last year that the team needed a leader, and despite the $100M he was receiving from the Skins, Haynesworth was more apt to show the sort of “Me First!” leadership that is so common amongst, say, NBA athletes. Still better came the beginning of training camp, when Haynesworth showed up out of playing condition, having avoided all of the team’s conditioning training of the off-season. Haynesworth was asked to complete a simple fitness test that even Mike Golic could pass, and he failed that test a number of times during the pre-season, sharply limiting his playing time in the warmup games, causing still more tantrums. It was the story that just wouldn’t die. Fast-forward to the beginning of the NFL season, and you’ve got Haynesworth not starting for the Redskins, playing some relief defense, and, of course, spending a few weeks on the injured list. Haynesworth would play just seven games this season before being suspended, without pay, for the remainder of the season for refusing to talk with Redskins coaches. Final line on Haynesworth’s 2010 Season? 7 games, 2.5 sacks, 13 tackles, 3 assists. And for that, he’s slated to receive $11M or so. Well, he will be if the union is successful in their grievance against the Redskins, otherwise that’s about $8.25M, or $3.3M per sack, $634,615 per tackle. With Haynesworth done for the season early, I think it’s pretty likely he won’t be in the burgundy and gold next season, especially given all the negative press surrounding his short tenure with the Redskins. Whether the Skins can successfully trade him, though, is yet to be determined, especially since all of these crybaby stunts will make the defensive end a bit of an albatross. There were a few sports media stories that fit into the year in the review. 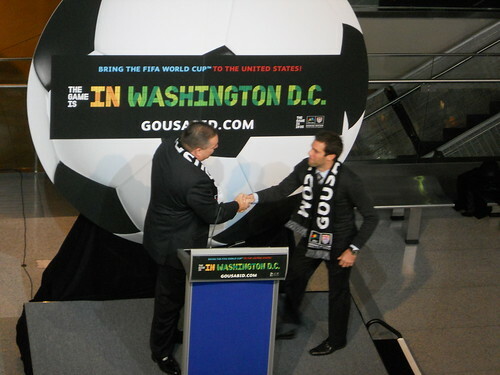 While none may stand alone as major DC 2010 memories, together, at least these two are worth noting. 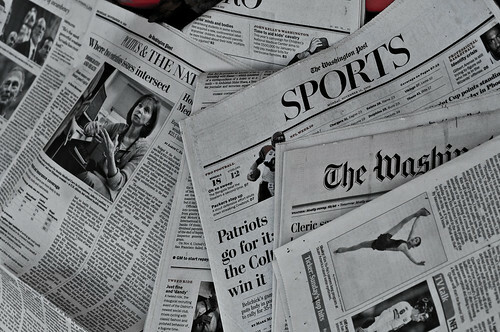 The sports media gaffe world turned its eyes toward Washington at the end of the summer when Washington Post columnist and WFAN host Mike Wise thought he would try and mock social media reporting regarding breaking news. The columnist’s idea was that he could get people to believe generally believable statements about news and rumors in the NFL if he, a credible source on these matters, shared them on Twitter. Fabricating a story is still wrong, at least to journalists, regardless of the channel used to share said stories, so Wise dealt with a little backlash, a suspension by the Post, and was forced to apologize that we felt that way. I remember thinking in the summer of 1980, after graduating from college and coming back to Washington for a second summer, that it would be a successful career if I got to have a byline from each of the major sporting events once in my life. It never dawned on me I’d wind up covering nine Olympic Games for The Post, or more than 20 Super Bowls, more than 20 Final Fours, more than 20 NBA Finals, or more importantly evolve to the point where the editors of this newspaper would trust me to lead the daily discussion about the news of the day and the changing cultural landscape as it all related to sports. A great reminder of just how influential Washington media can be – even outside of politics. Two pieces just missed the cut for us this year and both came from D.C. United. First, the rookie season of Andy Najar, midfielder, which netted the young phenom the Rookie of the Year award from MLS, on the back of his team-leading five-goal campaign in 2010. Najar drew near-universal praise from the often fickle soccer press, and successfully renegotiated his contract to remain in DC for at least the next five years. Najar was a bright point in an otherwise dim season for United, and it’s good to see that the United have their own Strasburg/Wall/Ovechkin to rebuild their franchise around. The second piece of news came shortly after the dismissal of embattled head coach Curt Onalfo. Onalfo finished his MLS playing career with United in 1999, and came back this season to coach the squad after three years in Kansas City. Following a 3-12-3 start, Onalfo was dismissed, and Ben Olsen was named to the interim coaching slot. 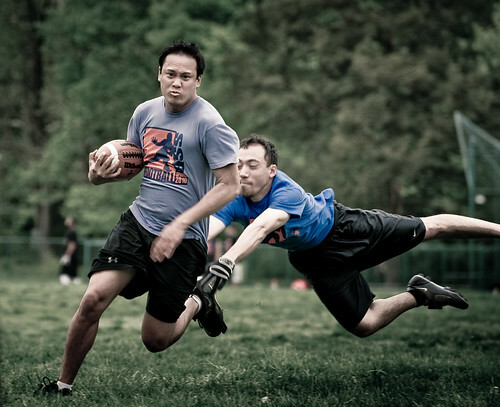 Olsen spent his whole playing career with D.C. United, playing 221 games for the Black & Red, as well as 37 games for the U.S. Men’s National Team. Olsen started as an assistant coach this season, and finished the season with a 3-6-1 record with the team. Olsen was named the head coach by the team in late November. With Olsen in the driver’s seat, and Najar riding shotgun, there’s a lot of reason to be optimistic for United next year. We’ll see if they can plug their offensive gaps. The debut of Ovechkin wasn’t nearly as big a deal though — I don’t think MCI Center sold out that night. He delivered just as well though, scoring 2 goals and busting the glass about 20 seconds into his career. Strasburg’s debut was amazing, probably best DC sporting event I’ve ever attended because of how the game progressed. Opening Night 2008 might have been more satisfying because of Zimmerman’s walk off though.